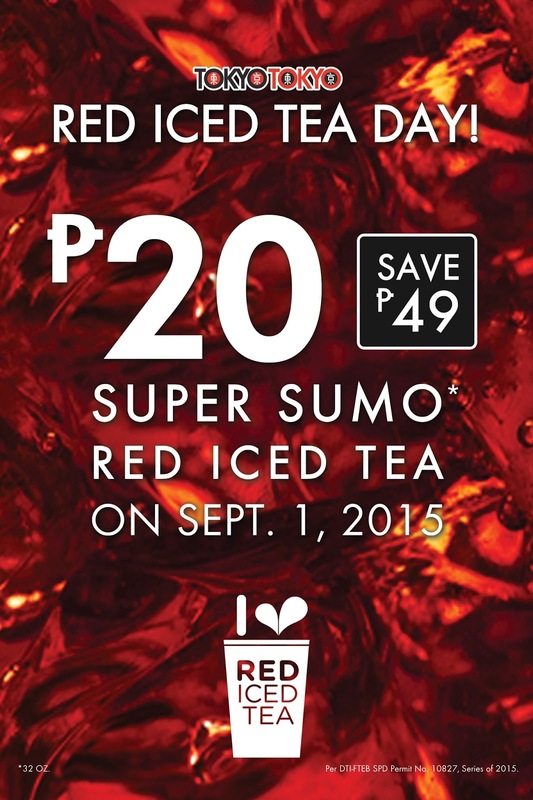 Tokyo Tokyo Red Iced Tea Day on Sept. 1- Super Sumo Red Iced Tea for P20! Sept 1, 2015 (Tuesday)- Save the date guys! Tokyo Tokyo, one of the country's top quick-service Japanese restaurants, is offering their signature Red Iced Tea in Super Sumo size of 32oz. for just P20!! This is in line with their celebration of Red Iced Tea day on Sept. 1 wherein all customers can get their favorite red iced tea for that unbelievable price. According to Tokyo Tokyo Product Manager Harvie Sering, this is a treat to Tokyo Tokyo's loyal customers, and to reinforce Tokyo Tokyo’s ownership of the brand’s most-loved drink. The 32 oz. drink is available in all Tokyo Tokyo branches nationwide for only P69! It's the perfect drink to quench Pinoys’ thirst and what more refreshing way to enjoy the much-loved beverage than have it in Super Sumo size. Join Tokyo Tokyo as it celebrates Red Iced Tea Day on September 1, 2015. Share your experience and photos by tagging Tokyo Tokyo’s Instagram and Facebook (@tokyotokyophilippines) and Twitter (@TokyoTokyoPHL) and use the hashtags #redicedteaday and #iloveredicedtea.